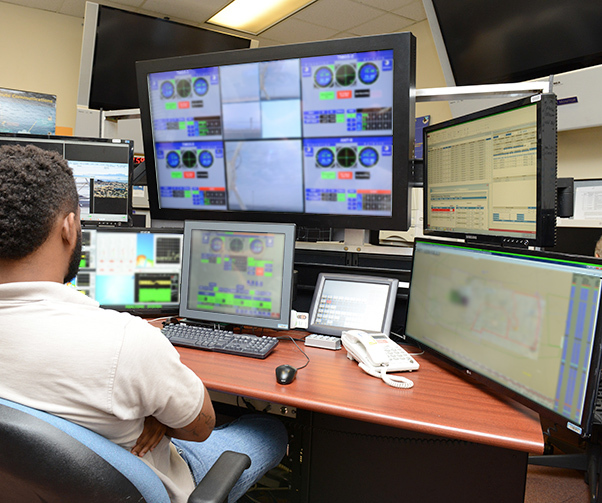 At Ridley Mission Control Center, an employee sits in front of the Single Operator Multiple Antennas station developed by the 412th Range Squadron June 7, 2016. SOMA is an example of the types of innovation that Brig. 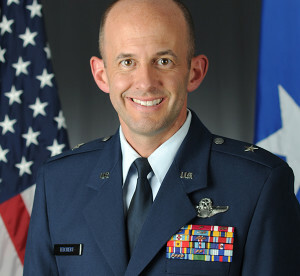 Gen. E. John Teichert, 412th Test Wing Commander, wishes to be developed. See below for Brig. Gen. Teichert’s announcement of the 116 Days of Innovation. 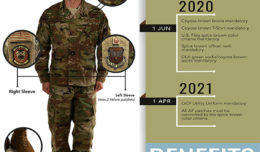 For the original article about SOMA, visit https://www.edwards.af.mil/News/Article/828304/join-412th-tw-on-its-innovation-journey. EDWARDS AFB, Calif.– In the midst of the Revolutionary War, the Second Continental Congress approved the Articles of Confederation on Nov. 15, 1777. This document, our nation’s first constitution, established the form of our federal government as we fought for and eventually won our independence. Yet, it was far from perfect. By 1787, it had become clear that major structural changes were needed to create a viable and sustainable federal government. With this in mind, a Constitutional Convention met in Philadelphia at the Pennsylvania State House to revise the flawed construct. As they looked at the changes required, however, they realized that the only real way forward was to start over. In those hot summer months, from May 25 to Sept. 17, those founders created the United States Constitution. Yes, in 116 days the world saw an innovation of government unmatched in human history. These men recognized the shortcomings of doing things the way they had always been done, refused to accept a few small fixes to cover up deep flaws, committed to doing something grand, and worked together in spite of their differences. Today, are there areas where we are ignoring the shortcomings of doing things the way they have always been done? Are we accepting a few small fixes to cover up any deep flaws? Have we refused to work together to do something grand because of our differences? 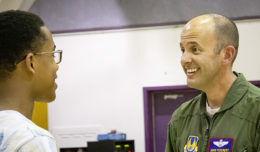 Edwards Air Force Base personnel are challenged by the 412th Test Wing Commanding General, Brig. 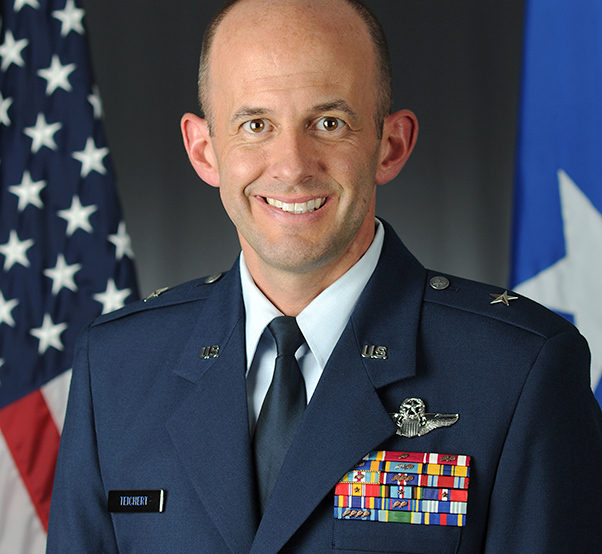 Gen. E. John Teichert to look for ways to innovate and inspire new ideas. 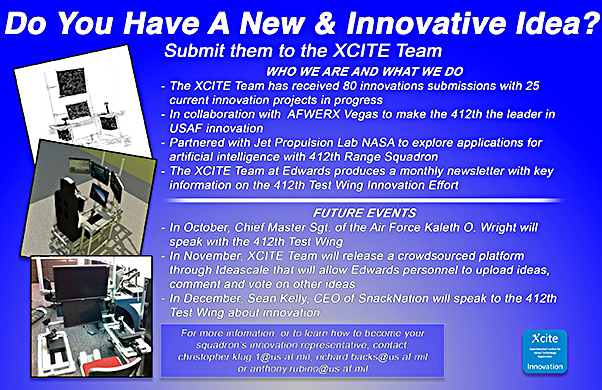 The base’s XCITE Team allows base personnel a way to submit and share ideas with others. It is the role of the 412th Test Wing to test tomorrow’s technology today. We do so to shape America’s arsenal for the warfighter. As testers, innovation is in our blood. It is a key part of our history and a fundamental characteristic of the hallowed ground on which we walk. More than ever, America needs us to unleash our creativity to solve our nation’s strategic problems. For the next 116 days, we will aggressively follow our forefathers’ lead. Starting today, we are instituting an innovation blitz in every unit and throughout our wing. We will leverage all of the energy and creativity that we can muster to pursue those innovations that will improve our processes, our lives, our units, and our ability to test and evaluate for the warfighter. We will look within ourselves and we will look around us. We will collaborate with others in the test community and throughout the Aerospace Valley. Brig. Gen. E. John Teichert III. In less than four months, our founders scrapped the government that enabled victory in the Revolutionary War in order to create something that was magnificent and lasting. What can we do over the next few months that is magnificent and lasting at The Center of the Aerospace Testing Universe? Our nation needs us to figure this out together, and I look forward to being dazzled by the full-scale 116-day innovation blitz of our world-class team.